Morro Bay is lucky enough to host the largest animals on earth year-round. Impossible to be kept in captivity, the only way to see the majestic creatures is to venture around their natural habitat. These massive migrators are a treasure to behold. 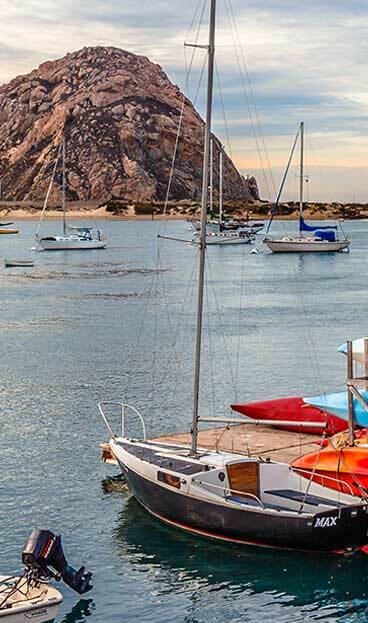 There are two different whale species that are abundant in Morro Bay. Magnificent humpback whales are seen outside of Estero Bay in April through October. And, in October through April, gray whales come to our waters. Aside from these visitors, it’s also common to see dolphins, seals, otters, and the occasional orca whale. North Point: Located at the end of Toro Lane in North Morro Bay is the locals’ favorite viewing spot. This area is situated on bluffs over Morro Stand Beach with benches for viewing. Bring your sack lunch and come catch a glimpse of the hundreds of whales that travel through. Morro Strand Beach: From Morro Rock to Cayucos Pier lies Morro Strand Beach; a gorgeous stretch of uncombed beach sprinkled with sand dollars. This is a great location to watch for breaching and water spouts. Climb on the sand dunes for a better view. Estero Bay: The bay is home to much marine life beyond whales. It’s common to spot harbor seals, herons, falcons and sea otters all in one day’s visit. Take a stroll on the harbor walk across from the smokestacks to see the otters’ favorite hang-out spot. They’re likely swimming along the water’s edge.